A business email address uses your company’s domain (yourbusiness.com) and your personal name (frank@yourbusiness.com), giving your brand a professional image. Set up a free business email address in just five minutes or less by choosing a domain and hosting provider, registering a new email address, and connecting it with your email client. Most business email address providers come with a cost, but you can get a free business email address from Bluehost. First, you’ll need a website and a domain name. Bluehost includes five free email addresses and a free domain with their $2.95/month web hosting package, making them a great choice for those just starting out in need of a website. Click below to check it out. A business email address is one that uses your business’ domain name, such as name@yourbusiness.com. Every business should create a business email address; they make your brand appear more professional, instilling confidence in customers and, by extension, increasing customer loyalty. Appear Professional to Customers – For your business to be taken seriously, you need to have coherent professional branding, which includes email. Every employee should have an email address with the same domain to maintain brand consistency. Increase Brand Awareness – A business email address uses your domain name—which almost always includes your business name—so every time an email is sent, your brand name is displayed to customers. This increases brand awareness. Build Customer Loyalty – A professional email address not only increases brand awareness, but conveys integrity and reliability. This makes customers more likely to do business with you. Keep Costs Low – Startup businesses with limited budgets can keep costs down and still create a professional image with a business email address, as they are often available for free with web hosting packages. There are very few options for finding a truly free business email address. However, we have found two great options to choose from: sign up with either Bluehost or Zoho. Bluehost is best for businesses that need web hosting, domain creation, and a free email address, while Zoho is best for those who already have domain hosting and simply want a free business email. Best for: Businesses that need a domain name, web hosting, and free business email. Best for: Businesses that have a domain name and need a free business email address. If you have a domain already, you can use Zoho to create a business email address completely free. It’s also great for businesses that use email marketing, as Zoho includes built-in email marketing tools. 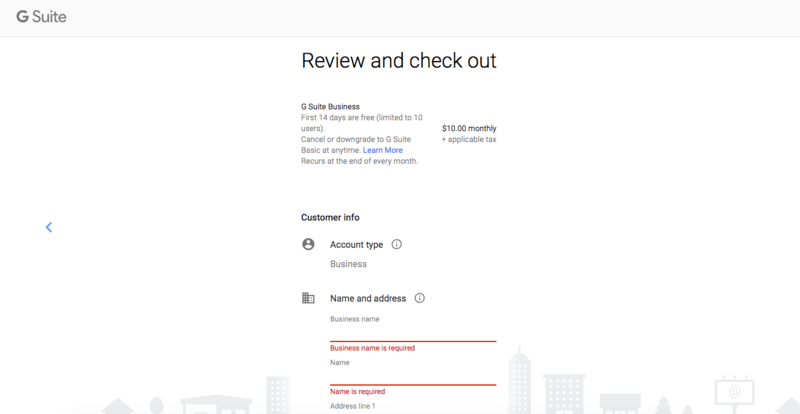 Below, we’ll walk you through the exact steps to get a free business email address, including instructions on how to connect your new business email with Gmail, Outlook, and other third-party clients. We’ll start with Bluehost, then move on to Zoho and a bonus option later in this article. Bluehost provides up to five business email addresses and free domain name when you purchase their $2.95 per month web hosting plan. To set up a free business email with Bluehost, start by going to their website, choosing the hosting plan that’s right for your business, selecting a domain, setting up an email address, and connecting it to a third-party email provider. Navigate to Bluehost.com. Click “Get Started Now” and select the subscription package you want. The basic plan should be sufficient if you don’t need more than five email accounts. If you need unlimited email addresses, you will only need to pay $2.50 more per month. 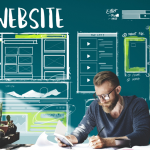 Every plan comes with a free domain, so the next step is to choose a domain for your website if you don’t already have one. The domain is the second half of your email address: yourname@yourdomain.com. Start by using the Bluehost domain name search tool below to see if the domain you would like is available. Selecting your domain name is a critical step in setting up your free business email, as it will affect how people perceive your business. If it is different than your business name, it may confuse customers and affect rankings in search engines. For tips on how to come up with the right domain name, see our article on the 25 Domain Name Tips from the Pros. Next you’ll enter your account information and finalize the order. There will be add-ons available before you confirm your order; you can select any of them, but it’s recommended that you at least pick Domain Privacy Protection to avoid spam in your mailbox. By law, your contact information becomes public after registering a domain. By selecting Domain Privacy Protection, however, Bluehost will add their own information to the registry rather than your own. 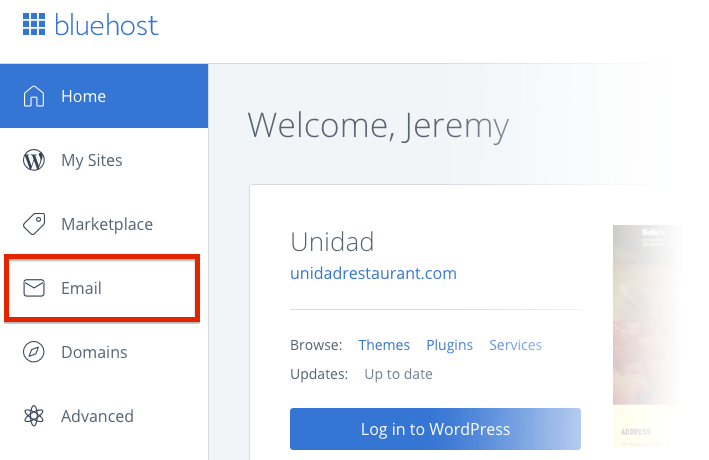 Once you’ve selected a domain and created your account, you’ll land on Bluehost’s dashboard. On the left menu, click the link that says “Email” to go to Bluehost’s Mail Manager. On the following screen, you will be prompted to enter an email name and password to create a new email account. Make sure you pick a format (such as “firstnamelastname” or “firstinitial.lastname”) that serves your brand, maintains your privacy, and can be used for future business email addresses. Also, make your password as secure as possible by using a combination of letters, numbers, and symbols. After choosing your email name and password, click “Save.” Repeat this step for each employee who needs a free business email address. 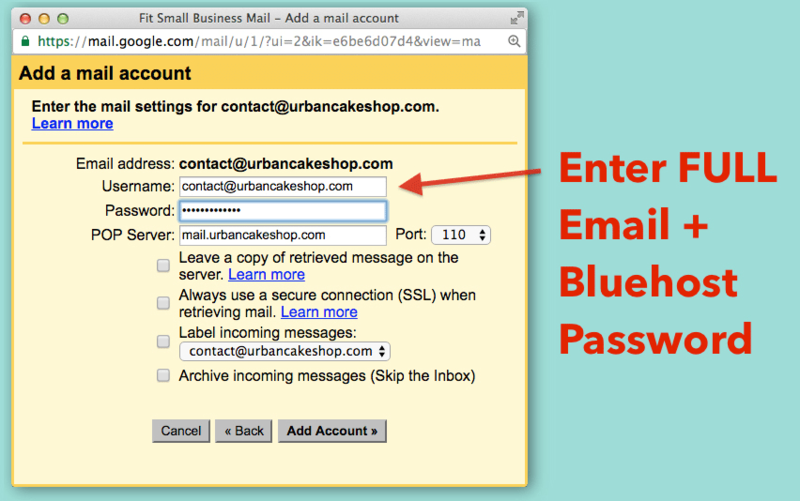 To quickly access your webmail inbox, go to Bluehost’s login page and click “Webmail Login” instead of Hosting Login. If you don’t want to log into another mail account to check your email, you can connect your new business address with your current inbox, including Gmail, Outlook, Apple Mail, iOS, or Android Mail. While each client is different, you’ll typically need to add your username and password, verify your account, and input mail server information in order to use your free business email. This will open a pop-up window where you’ll enter your new Bluehost business email. In order to connect it to Gmail, you will need to enter your Bluehost username (your full Bluehost email address) and password, confirm your POP server is correct (this is what’s used to collect new email and should be mail.yourdomain.com), and click “Add Account” to save. IMPORTANT: Be sure to enter your FULL email address under Username (e.g., yourname@yourdomain.com). On the next screen, enter your email address and password once again (like before, be sure to enter your full email address). 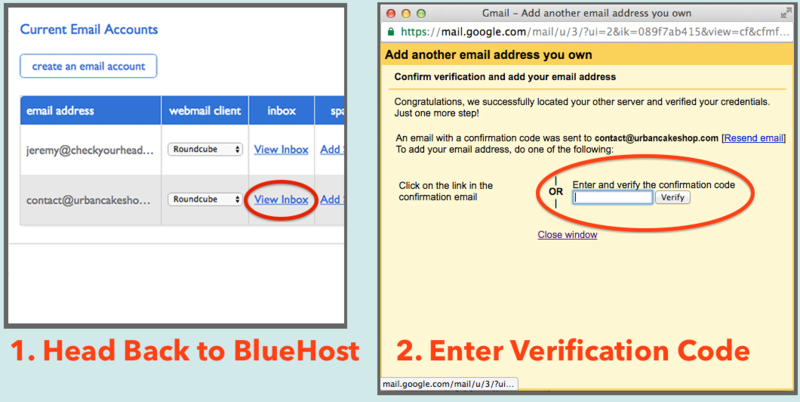 This will prompt Gmail to send a verification code to your Bluehost address; on the next screen, Gmail will ask you to input that code. Head back into your Bluehost account. 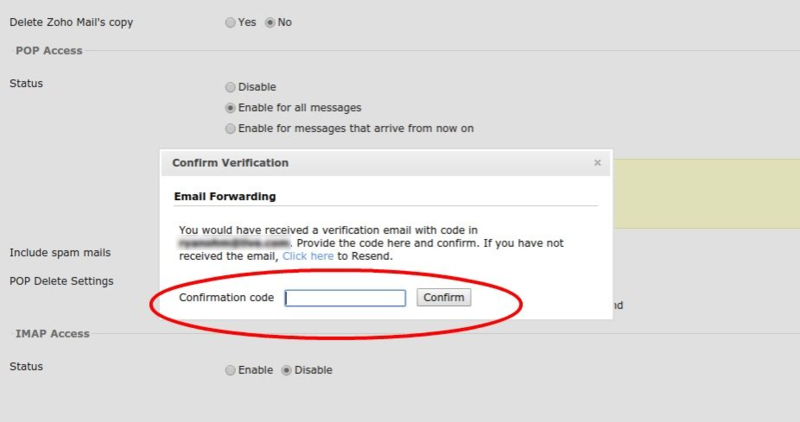 Select “Email Manager” and click “View Inbox.” You should see an email from Google with your verification code. Copy this code and enter it into the verification field in Gmail. Once you’ve combined your accounts, you’ll be able to navigate between your professional and personal email addresses within Gmail. Wait five to 10 minutes for the changes to take effect, then compose a new email in Gmail. You’ll notice that you can now select different “From” addresses; whichever you pick will appear on all outgoing mail as your “Reply to” and “From” address. Email forwarding sends a copy of all mail from one address to another automatically. This step is optional, but it’s helpful if you’ll be using a generic email address (like contact@yourbusiness.com, for example) and you want messages forwarded to your employee’s inboxes. You can set this up easily by clicking on the “Forwarders” tab on the Bluehost Mail Manager menu. Click on “Add a New Forwarder” and select the business email address you would like to forward from the “Address to Forward” drop-down menu. Then, below that, enter the address the email should be forwarded to. 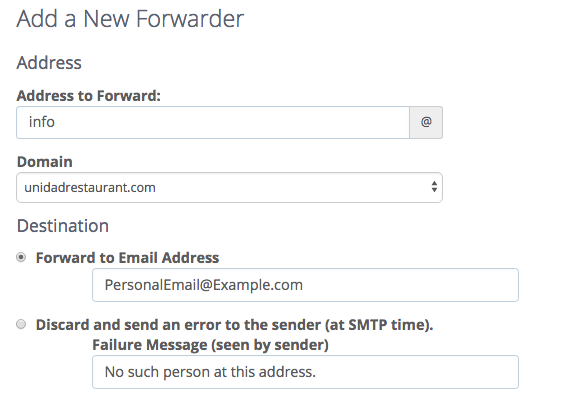 If you want emails to forward to multiple addresses, simply click “Submit” and create another forwarder. If you already have a business domain and hosting, you can use Zoho to set up a completely free business email address. In fact, they offer up to 25 free business email accounts, each with 5GB of data. 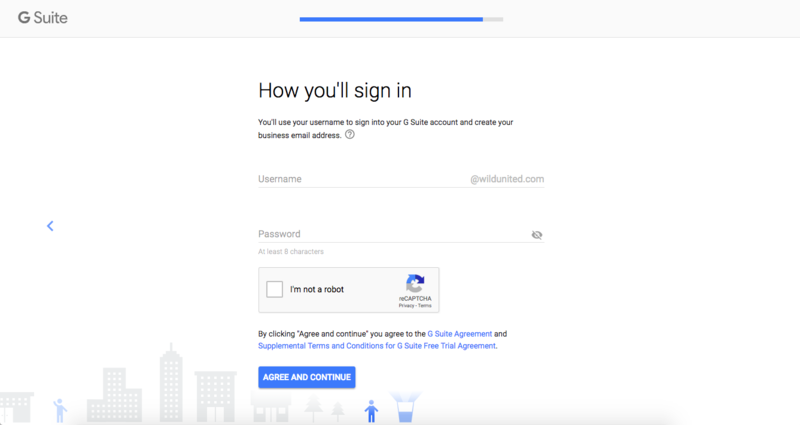 To set up a free business email with Zoho, go to Zoho.com and sign up for a mail account, verify your domain, update your mail server information, and create your business email address. Next, you’ll need to verify that you own your domain. The exact steps will vary depending on which provider you used to purchase your domain. We’ll use GoDaddy as an example, as it’s one of the most commonly used domain name registries. If you want instructions for a different provider, just select your provider from the list available on Zoho and they will supply directions. Then, head over to GoDaddy and click “Manage” next to Domains. Click on your domain to bring up the domain submenu. 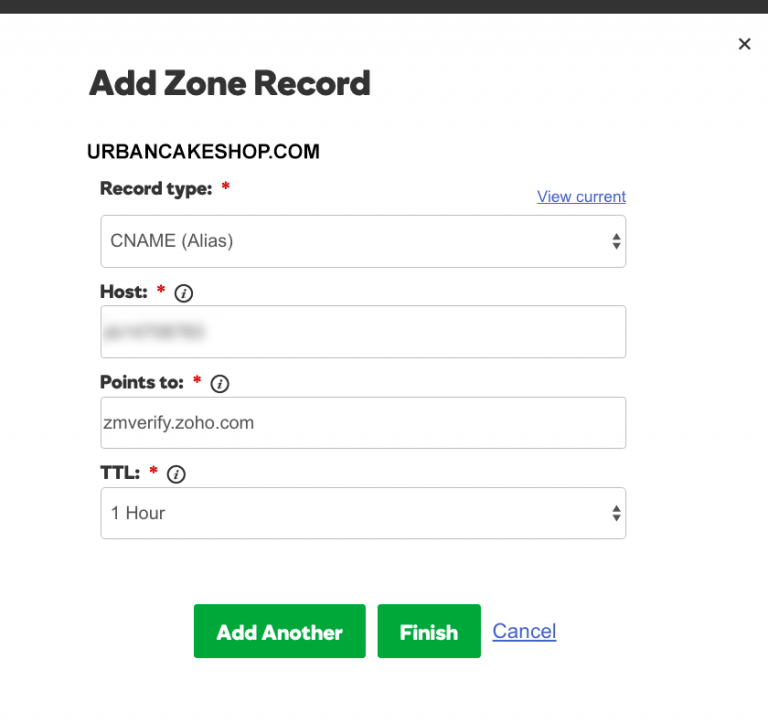 Select the “DNS Zone File” tab on the top, then find “Add Record” a little further down. Remember to click “Save” when you’re finished. Now, return to Zoho and click “Verify by CNAME” at the bottom of the screen. Once your CNAME has been verified, you will need to update your mail records. Now that your domain is verified, you need to update your mail records with GoDaddy. Head back to your domain and click the “DNS Zone File” tab. These changes will complete the mail record setup process. It generally takes around 30 minutes for these changes to take effect, at which point you can head back over to Zoho and create your new business email address. Now that your domain has been verified, you will be given the option to add email in Zoho Mail Manager. Start by clicking on “Create Account” in Zoho Mail. Input the username you would like to use as the first half of your business email address, and click the “Create Account” button below. 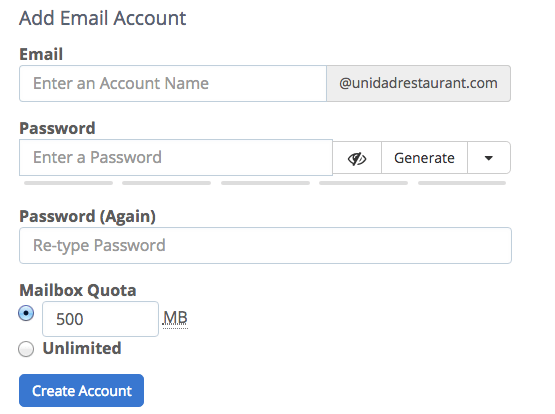 If you would like to create accounts for your employees, go to “Add Users” and create new email addresses. Addresses can be changed later should you need to update formatting or remove a user. If you want to forward your new free business email to an existing email account, click the “Email forwarding” option, enter the address you want to send emails from and to, and complete prompts to complete the forwarding setup. Keep in mind that Zoho does not allow you to connect free accounts to Gmail or Outlook, so you’ll have to access all of your email using Zoho’s email client. 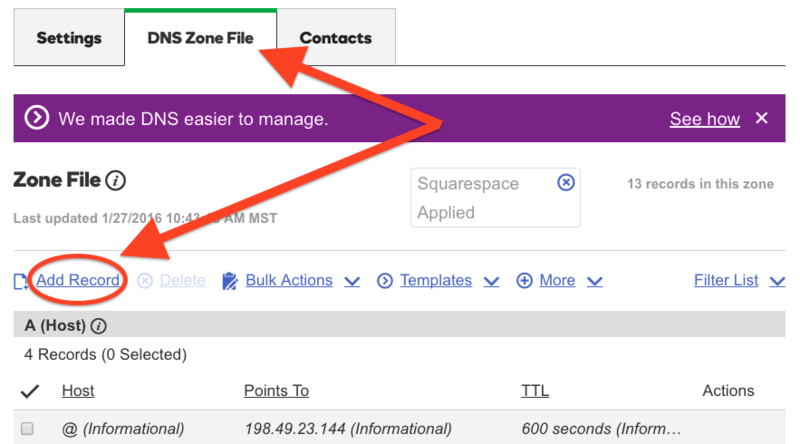 To set up email forwarding in Zoho, click the gear icon in the upper-right corner, then select “Email forwarding and POP/IMAP” in the lower left column. Next, enter the email address you want to forward messages to at the top. Zoho will send a confirmation code to that email. Simply click “verify” and enter the code in Zoho Mail. Once you have verified your forwarding account, you will be able to access your business email messages in your primary email inbox. 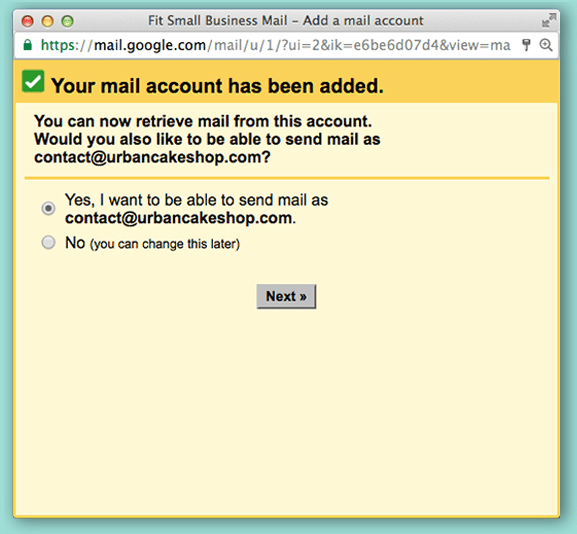 Google offers business email addresses through Gmail with a free 14-day trial. After the free trial, the monthly fee will be $10 per user per month for a month-to-month contract or $4.95 per month on an annual plan. To get a free business email with Gmail, start by creating a Gmail account, adding your domain, creating your new business email, and confirming your choice to start a free 14-day trial. 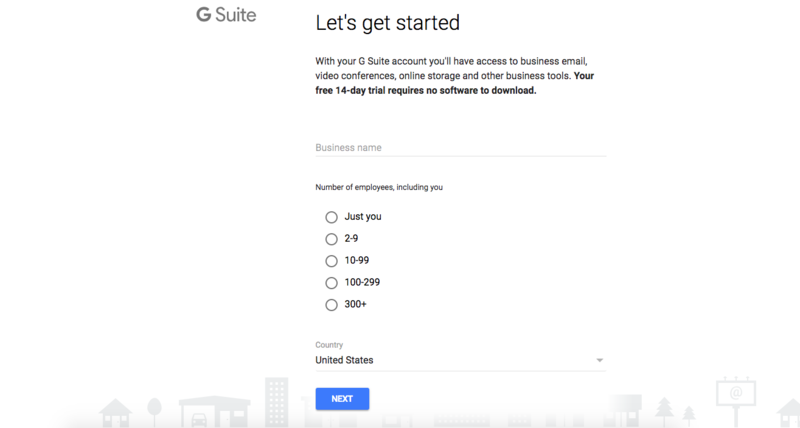 Go to G Suite and click the blue “Get Started” button to begin the process of creating your business email address. Follow the new account registration steps, such as inputting your business name, company size, and your personal contact information. If you have already registered your business’ domain name, select the “Yes, I have one I can use button.” This will prompt you to input your business domain. If you do not have an existing domain, you can buy one by clicking the “No, I need one” button. On the next screen, enter the username for your business email address. Remember to choose an email format that you can use for all business email addresses in the future. Confirm your free 14-day trial and continue to the next screen. Confirm your business details and input your payment information. You will automatically be charged on a monthly basis after your free trial period expires. However, you can cancel anytime before that point if you choose to use a different business email provider. To start using your new Gmail account, go to Gmail and login. If you would like to set up email forwarding, follow the steps outlined by Google. Before you choose a free business email provider, consider things like the ability to connect your domain, the price per address, reliability, and the amount of storage included. Also consider if it comes with additional tools or features needed by your business. Custom Domain – A free business email address uses your company’s own domain name, so be sure your email provider allows you to choose or connect your own. Number of Email Addresses Included – Some plans include only five email accounts, such as Bluehost, while others, like Zoho, include 25 addresses. Make sure you pick one that fits your business’ current needs and allows you to grow. Storage Capacity – If you send a high volume of emails with attachments, you will want to choose an email provider with high enough storage limits—typically more than 10GB. Reliability – You don’t want to have to worry about your email crashing, so look for email providers that have uptimes of 99% or more. Business Tools – When you’re picking an email provider, it’s common to find additional built-in business tools such as a calendar, video conferencing capabilities, and word processing tools. Consider these carefully when picking an email host. For a free business email address, we recommend Bluehost and Zoho because they are both reliable web hosting providers that offer free email. Bluehost web hosting plans start at $2.95 per month, which includes five free business email addresses. For $5.95 per month, they offer a hosting plan with unlimited free business email addresses. While you can get free email address at Zoho if you have your own domain, paid Zoho plans with domain included only cost $1 per user per month and include robust email marketing tools. When choosing a free business email, choose an email address that clearly identifies the individual user, and maintain that format across all of your employee addresses. This helps maintain overall organization, especially for a growing business. Choose the Right Domain Name – It’s important to choose a domain name that allows people to quickly identify your business. If you have trouble finding an available domain name, try including keywords, such as location, in your domain. See more tips on how to choose a domain name. Use a Standard Format for All Employees – The formatting of your email addresses should be universal across your company because it keeps email addresses organized. So, if you choose the “firstinitiallastname@” format for one employee, it should be the format for all employees. For more guidance, read our article on how to create a professional email address. Create Special Email Addresses by Departments – Giving visitors special email addresses to contact for support, sales, press, and general questions looks professional and keeps your business better organized. For example, for customer service, use an email such as support@yourbusiness.com on your website. 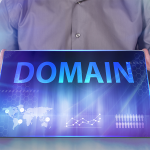 The best domain is typically your business or brand name. However, not all domains are available, and you might need to add additional words to your domain if your desired one is already taken. What’s more, adding keywords can help with searchability. Use .COM – People tend to assume that websites end in .com, and are also more trusting of .com over other top-level domains (.net, .co, and .io). Include Keywords (Such as Location) in Your Domain Name – Adding your location not only increases the chance that the domain will be available, it also means there are more keywords in your URL that you can potentially rank for on search engines. For example, if your domain is www.maggiespizzanyc.com, when people conduct a search for “pizza nyc,” you will have more keywords in your domain that match the search. Consider Adding a Prefix or Suffix – If your current business name is unavailable as a domain, don’t give up. You can add prefixes, such as “the,” “my,” or any short adjective, or suffixes like “”biz” or “co” to increase your chances of finding an available domain. If people have heard of “Cornerstone Bakery” and your domain is “bestcupcakesintown.com,” it will be harder for people to find you when they do a Google search of your business name. Email signatures are set up within your email provider’s settings. For example, if you’re using the Gmail interface, click the gear icon in the upper right-hand corner and select “Settings” from the drop-down menu. Under the “General” tab, scroll down to your signature. In the text box, input your first and last name, title, company name, and contact information, such as email address and phone number. For more information, check out our 25 business email signature examples from the pros. What Are the Most Common Business Email Address Formats? Typically, business email addresses use the employee’s first name, last name, or some combination of first and last. For example, here is one with the first name only: john@yourbusiness.com, and here is one with first initial and last name: jsmith@yourbusiness.com. Businesses also often use a general inbox, such as info@yourbusiness.com. How Can I Find an Available Domain Name? Choosing the right domain can be difficult as many are already taken. Use our Bluehost domain widget above to search available domains; choose one that uses a .com and matches your business name. When this is not available, try adding keywords or suffixes to your business name to find a suitable domain name that is available. For more ideas, check out our top 25 tips when choosing a domain name. What Are the Best Business Email Providers? The right email provider for you depends on your needs and preferences, though the best are reliable, easy to use, include a reasonable amount of storage, are affordable, and are feature-rich. We recommend Bluehost and Zoho as they are the most comprehensive. Learn more about these providers and more in our article on the six best business email providers. A free business email address gives you a way of presenting your business professionally by connecting your business domain name to your email. It helps make potential clients and customers feel more confident in your business as it builds brand awareness and solidifies a professional image. Given these advantages, all businesses should create their own free business email address. Creating a professional email address is a good start for your business. However, it’s equally important to have an attractive website hosted by a reliable web hosting provider like Bluehost. For only $2.95 per month, you can get a free domain name, WordPress website, five free business email addresses, and more. Click here to get started. Zoho is no longer free. It’s $3-$6 per month for a business account. Thank you so much for your comment, Spiridoula! It looks like Zoho still offers a free email account through their website. You can create an @zoho.com email that is perfect for personal use or enter your web domain to sign up for a business email account for up to 5 users (5GB/user and a 25MB attachment limit). In addition, you can purchase a Basic Workplace account for $3/user/month or a Professional Workplace account for $6/user/month. These plans include Zoho mail but also feature other tools like Docs and the Zoho Office Suite. Users interested in trying the service can also get a free 15-day trial of the Professional Workplace service without providing credit card information. We’ll be sure to include any new pricing information when we update this article! is the bluehost stuff paid by credit cards only? and once i paid a package, when can everything start? Bluehost accepts credit cards, PayPal, checks, and money orders for payment, but credit card and PayPal is instantaneous. Once the registration is set up, you can start using all of the features you signed up for. Hope this helps! Once you have a domain, Zoho provides a professional email account completely free, which would otherwise cost ~$3-5 per month through another provider. However, Zoho recently disabled IMAP/POP on free accounts, which means you cannot use the email with gmail/outlook/apple inboxes. You have to use Zoho’s web mail client. Business Email, Domain and Hosting - $2.95/mo.